The pinnacle of match drop in action parts has arrived. Introducing Volquartsen's new Ruger 10/22 Ultra Match Hammer & Sear. 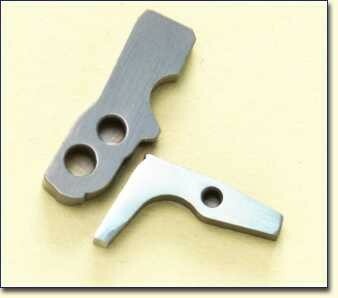 These parts are EDM and machined out of special alloys in Matched Sets. The parts go through a series of processes, which because of the competitive market for aftermarket parts will not be revealed, that produce the most unbelievable crisp, perfect, trigger let off that we think can be achieved!! All dimensions are held to extremely tight tolerances. The critical engaging and bearing surfaces are held to +/- .0001". Complete customer satisfaction is guranteed! Due to the exactness of these parts, they will only be sold in match sets.